Valentine's day is almost here and CJ wanted to make Valentine cards for her friends. She was so specific that the card should have a heart. So we browsed and browsed. I found lot of DIY cute/fun cards on familyfun.com site but my little girl wanted something more. She said "Mommy why don't you think of something cool". So I was thinking and thinking. When I saw this beautiful bouquet card linked up at Mindful Meandering Artsy-Craftsy Challenge, I knew that would make an Ice cream cone heart. I had decided but waited for CJ. So when she came from School, I told her my idea and she was super-duper excited. We made a heart and folded it. The front page of the card(one lop of the heart) is Ice cream cone and when you open it you have a heart. It turned out pretty good! 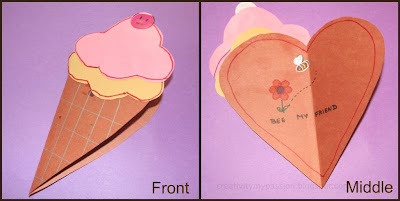 Using the template, Cut the Heart out of Brown construction paper, Ice cream scoops out of pink/blue and cream construction papers. 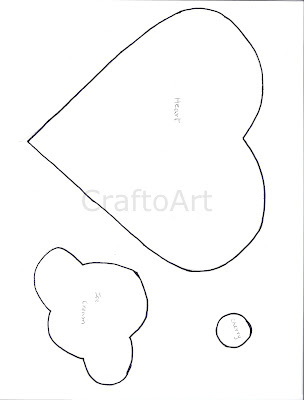 Fold the Brown paper heart and glue the scopes of Ice cream on the front lop of the heart. Decorate as you wish with glitters, markers. In the below card CJ just colored the pink paper for cherry top. 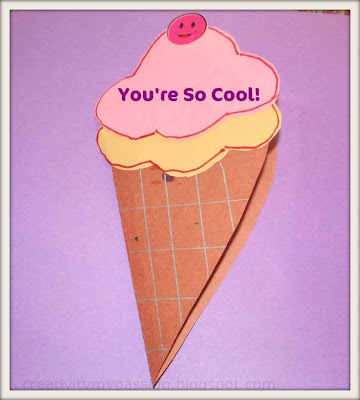 I wrote "You're so cool"
In the inside of the card(heart), write your valentine message. Cj belong to Busy bee class. So we drew a bee, flower and wrote "Bee my Friend"
What a cute idea! I love how the cone opens up into a heart. You are so creative! Loveeeeeeeeeeeeeeee this.. It looks fab & is easy too.. Going to try it with lil P tonight. Yes shruthi! We have to make 10 cards of the same size. so i kept it simple this time. Sure do try it with lil p. she will love it! Cute! Particularly like the heart shaped cone! I would have never thought of this idea but, I make perfect sense for a cone to open into a heart. great idea, love the not so obvious heart! thanks so much for sharing on Craft Schooling Sunday! Really cute and could be used for a birthday card too, I think! Thanks for linking this to Kid's Co-op! Thank you for the link up on Made with Love, I've pinned it on my special made wth love board!